The Tandy/RadioShack TRS-80 line was originally introduced in 1977 with the Model I, which makes it one of the earliest mass-produced home computers. Because of its capability and relatively low price tag, it quickly gained a lot of popularity. Over the following several years, a number of successors were introduced, including the portable TRS-80 Model 100. You can still find working examples, but when Trammell Hudson found a used Model 100 with a bad motherboard, he decided to upgrade it with a modern brain. 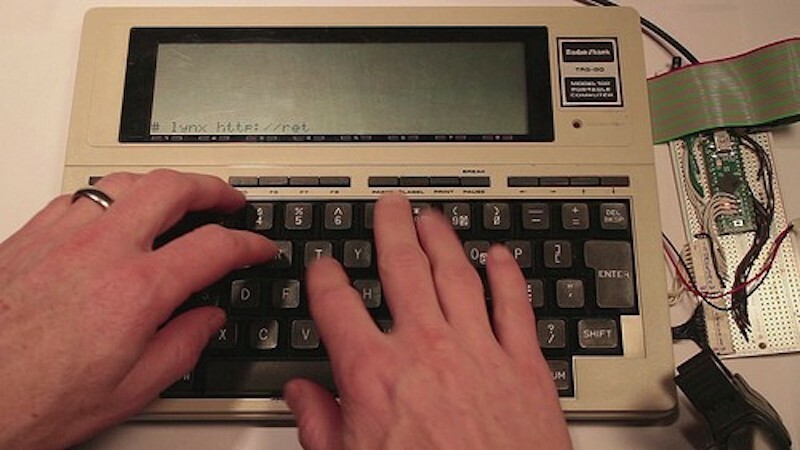 The TRS-80 Model 100, which was released in 1983, stood out because of its portability. It had a built-in 40×8 character LCD, could run off of four AA batteries for weeks, and even featured a 300 baud modem with acoustic couplers. That all added up to a perfect computer for people on the go. But, despite the small overall size of the TRS-80 Model 100, the motherboard was predictably bulky. 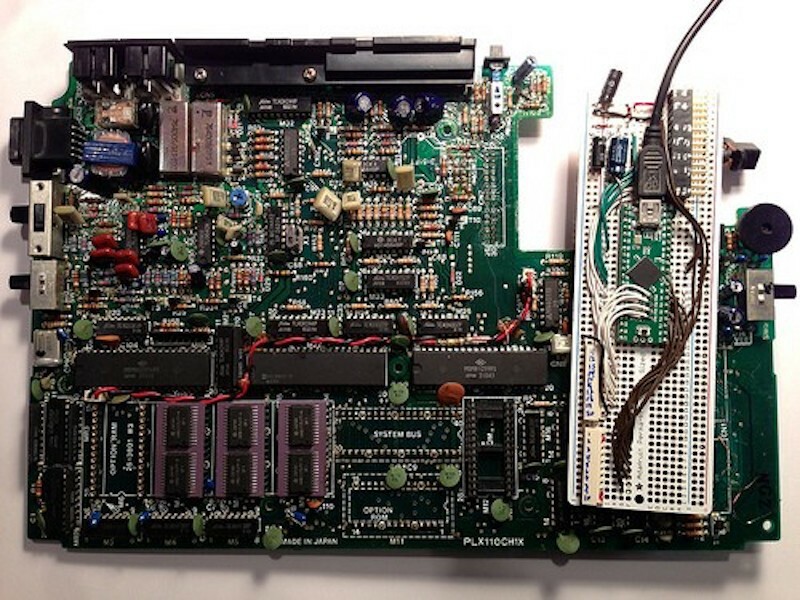 That meant that Hudson had plenty of room to replace it with a small modern microcontroller board — a Teensy++. While the Teensy packs far more power than the original 2.4MHz Intel 80C85-based motherboard, Hudson still faced the challenge of making it work with the original LCD display and keyboard. He first had to identify how the LCD drivers worked, and then had to write libraries to drive them — including a font set to work with it. The mechanical keyboard was a more straightforward affair, since it’s a standard matrix design. It did, however, lack many of the keys that we expect on modern keyboards. To address that, Hudson had to implement some modifiers to select those keys. He’s already got basic VT100 terminal functions working on the upgraded TRS-80 Model 100, and plans to add more features in the future. 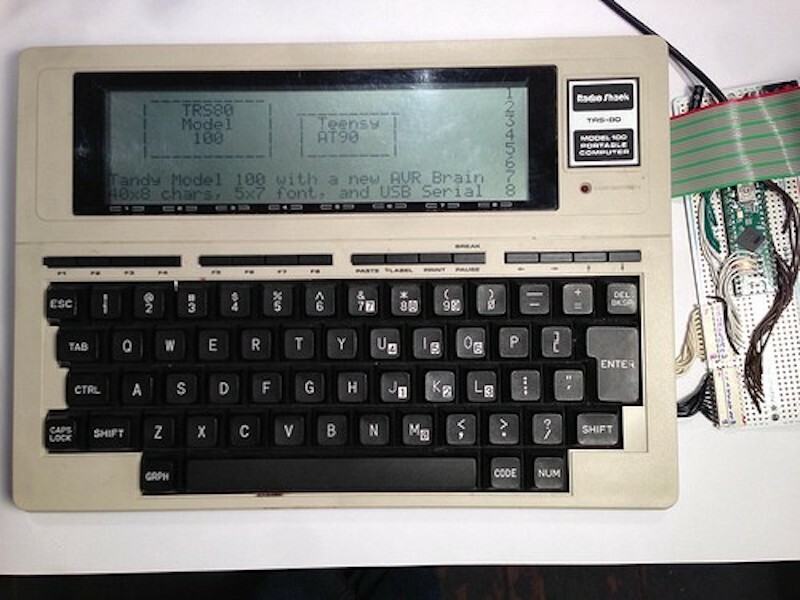 A Classic TRS-80 Model 100 Updated with a Modern Brain was originally published in Hackster Blog on Medium, where people are continuing the conversation by highlighting and responding to this story. Copyright 2018 by Iotosphere.com. All rights reserved. This material may not be published, broadcast, rewritten or redistributed. Iotosphere.com is a participant in the Amazon EU Associates Programme, an affiliate advertising program designed to provide a means for sites to earn advertising fees by advertising and linking to amazon.co.uk. iotosphere – Internet of Things Copyright © 2019.